Entertaining Food: Since When Is Mall Food Zagat Rated? Since When Is Mall Food Zagat Rated? If you’re in Pacific Place and want to grab a quick bite to eat before seeing a movie, your choices are sushi, burgers, Thai, American, or Mexican. Fortunately, Mexico Cantina Y Cocina serves up delicious food at a price that will leave you enough money for popcorn and a drink. Ryan and I have eaten a late lunch or early dinner here on more than one occasion as it’s our fall-back restaurant when our favorite waitress isn’t working next door at Gordon Biersch. This time, Chris was able to join us. Because we mercilessly devoured the chips and salsa, we had to settle on ordering an appetizer and Flautas de Pollo looked perfect. 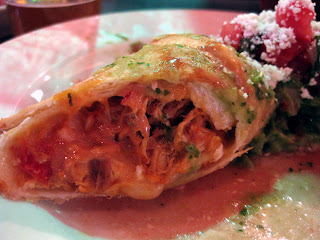 Stuffed with shredded chicken, peppers, and cheese, then wrapped in a flour tortilla and deep-fried, you really can’t go wrong with the Flautas. It even came with a side of their house guacamole topped with Cotija cheese. The portion was just big enough for us to stop greedily eyeing the chips and salsa and wait patiently for the rest of our order. Ryan confessed he wasn’t terribly hungry, so he wanted to order a soup and salad. (This happens rarely enough that Chris and I both had to tease him about it.) He started with Jane’s Mexican Wedding Soup, a classic, hearty, chicken and Mexican rice soup with a Southwest twist: green chilies, corn, and avocados. 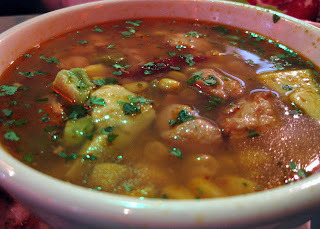 The chicken was plentiful and tender and the soup had big chunks of each ingredient. The bowl was actually a generous portion that could probably replace an entree (maybe with a few chips and salsa) if your appetite’s on the smaller end of the scale. 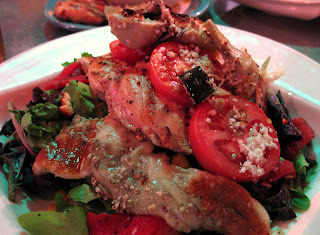 The salad Ryan decided would best accompany his Wedding Soup was the Mexican Chop Salad. Ironically, though in keeping with Ryan’s love of carbs, he said the best part about the salad was the slightly sweet jalapeno cornbread croutons. The salad is packed and included organic greens, avocado, sweet and smoky roasted red peppers, roasted corn, Cotija cheese, pico de gallo, and black beans. It was topped with a cumin vinaigrette that, unfortunately, was a bit heavy-handed with the cumin. Also, for two dollars more, you can include either grilled chicken or fajita beef added and make this a serious entree. 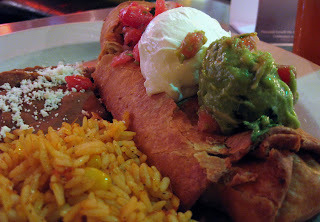 Our love of deep-fried foods is hardly a secret, so it was no surprise when Chris ordered the Chicken Chimichanga complete with shredded chicken and jack cheese served piping hot in a deep-fried flour tortilla. It was accompanied by scoops of sour cream, guacamole, and pico de gallo as well as refried beans and rice. The chimichanga was slightly overcooked (you can see in the photo that the end was crunched in and crumbling), but the inside was piping hot and very cheesy. The condiments were nearly the most flavorful thing on that dish because the beans and rice were boring and bland. 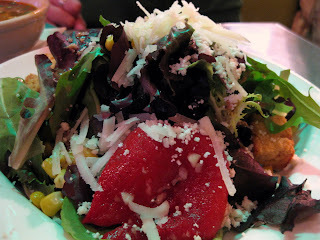 In keeping with the “healthy choice” theme Ryan had started and Chris completely ignored, I found myself searching the menu and continually coming back to the Ensalada a la Evelyne. The generously portioned salad comes piled high with fire-grilled chicken stacked on organic greens, roasted artichoke hearts, tomatoes, and avocado. It also had pepita-crusted (yes, that’s right: pumpkin seed crust) provolone cheese that was absolutely delicious. There’s nothing better than grilled cheese, except maybe tender and juicy grilled chicken. The big chunks of tomatoes worked well with the large pieces of chicken and provolone. The salad usually comes with a tequila-lime dressing, but I was glad I ordered it on the side as it was a bit overpowering. It’s about as rare for us to order two desserts as it is for Ryan to order a salad. However, sugar deliciously compels and we were left with a unbreakable tiebreaker: crunchy or creamy. Given there were three of us at the table, we figured two desserts couldn’t be more appropriate! We began the sugar rush by ordering the Chocolate Mousse. 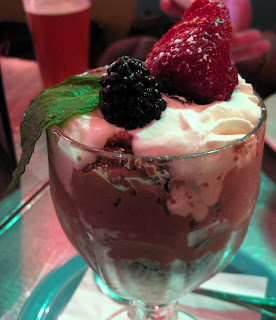 The Patron XO and Kahlua chocolate mousse was thick, rich, and creamy, and topped with a blackberry and strawberry, along with a generous dollop of whipped cream. The dense mousse clung to our spoons as we hungrily licked our lips. Honestly, I wasn’t expecting much from the mousse but it was surprisingly good. It definitely tasted homemade and the serving glass was large enough for all three of us to have several bites each. We ended our late lunch with arguably the most well-known and beloved of Mexican sweets (at least by an American audience): the Churro. The carnival favorite of slightly sweet "donut" dough is deep-fried, then immediately sprinkled with cinnamon and sugar which stick to the hot oil. The order of four churros was plenty, but unfortunately they weren’t as good as the mousse. 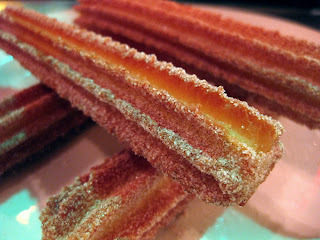 The churro dough had an unidentifiable accent flavor (we three finally agreed it was “citrus”, but even that was vague at best) that was unexpected and unwelcome. We felt the star flavors should be the cinnamon and sugar, but instead found it competing with the secret ingredient. Overall, you can expect a meal at Mexico Cantina Y Cocina to be better than average and a solid choice regardless of the real reason you were in Pacific Place. The service has always been at least good and sometimes excellent, though we haven’t tried dining during primetime hours or holidays.